With The World's 50 Best Restaurant Awards being held in my hometown of Melbourne this week (which I was lucky enough to attend! ), and so many world class chefs showcasing in town, I was inspired to create a little something adventurous this week. After a little experimentation, I came up with this new chocolate semifreddo with chili, strawberry, olive oil and rose recipe that I’m super excited to share with you all! This dessert has a weird and wonderful combination of flavours that just seem to work together. It’s also quite simple to prepare and can be easily adjusted to suit your tastes. A little while ago a friend of mine introduced me to vanilla ice-cream with a drizzle of good quality extra-virgin olive oil and a pinch of flaked sea salt. It tasted amazing, so I thought I’d work it into this dessert. The drizzle of extra virgin olive oil gives the recipe a grassy, earthy taste (in a good way), and mixed with the sea salt makes the recipe pop! Although, when I say little drizzle, I really do mean a little drizzle. The flavour could be overpowering (and taste weird) if drowned in olive oil. Enjoy the recipe and if you have any questions, please let me know in the comments below. Place the strawberries onto a paper lined baking tray with the vanilla, maple and chili. Bake in the oven at 180 degrees celsius (356 fahrenheit) for 30 minutes. Once cool, blend in a food processor or blender until smooth. Drain the soaked cashews, then transfer to a blender or food processor with ⅔ cup water and blend until very smooth. Add the coconut sugar, melted cacao butter, melted coconut oil, cacao powder, vanilla and sea salt to the cashew mixture and blend until smooth. Add the coconut milk to the mixture and blend until smooth. Pour the mixture into an ice-cream maker and churn until thick (according to the ice-cream maker instructions). If you don’t have an ice-cream churner, whisk or whip the mixture in a mix master until the mixture is light and fluffy or frothy. Scoop or pour half of the cacao mixture into a rectangular baking tin. Then scoop ¾ of the strawberry chili puree on top. Finally, scoop or pour over the remaining cacao mixture and smooth over with the back of a spoon. Place into the freezer to set for 4-6 hours or overnight. 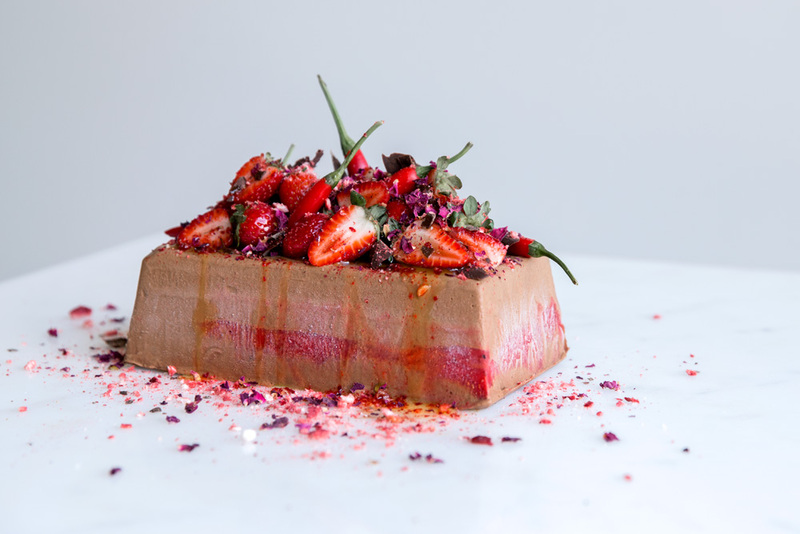 Turn the semifreddo out onto a serving plate, top with fresh strawberries, vanilla strawberries, chili’s, dark chocolate, crushed freeze dried strawberries, rose petals, drizzle with olive oil and sprinkle with a little flaked sea salt. Enjoy!